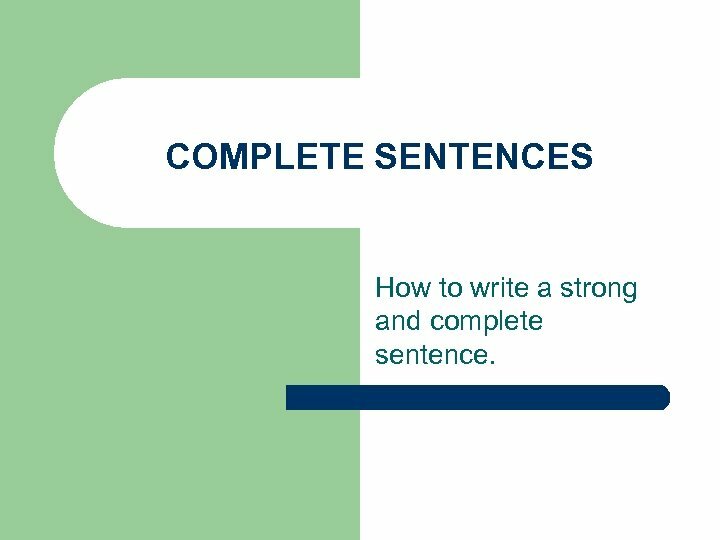 COMPLETE SENTENCES How to write a strong and complete sentence. 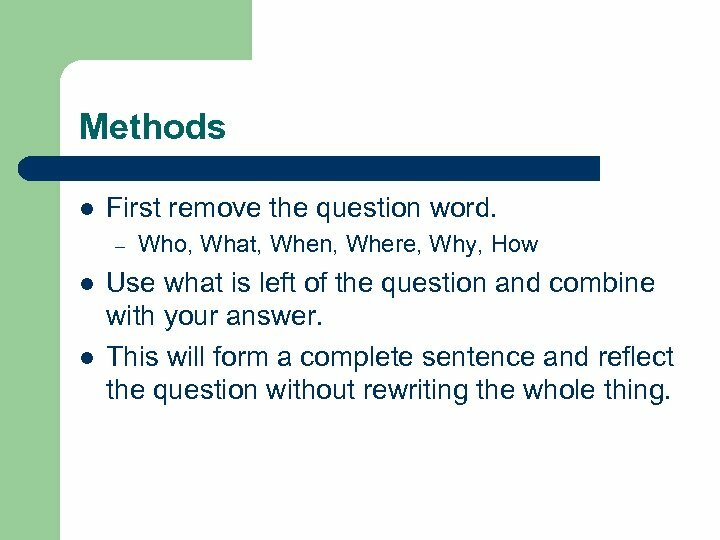 Methods l First remove the question word. – l l Who, What, When, Where, Why, How Use what is left of the question and combine with your answer. This will form a complete sentence and reflect the question without rewriting the whole thing. 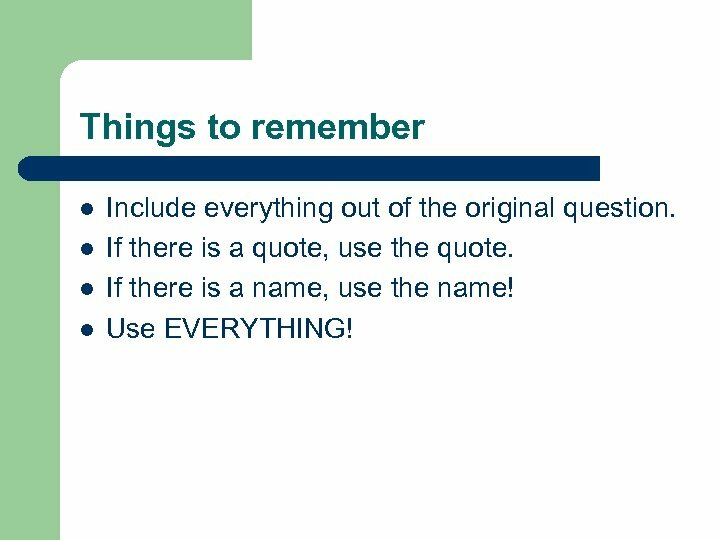 Things to remember l l Include everything out of the original question. If there is a quote, use the quote. If there is a name, use the name! Use EVERYTHING! 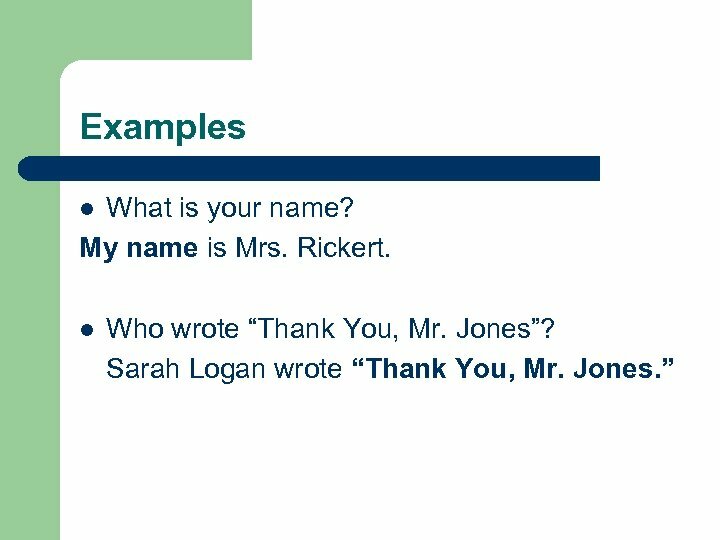 Examples l l The length of the question doesn’t matter. It is always set up the same way. 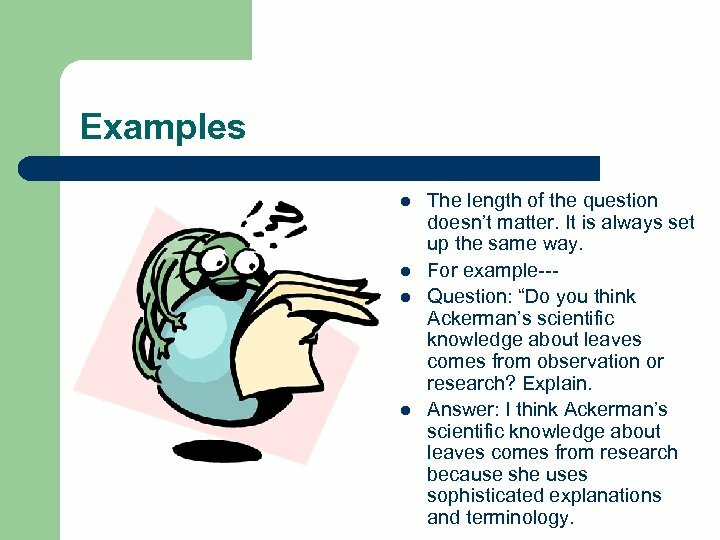 For example--Question: “Do you think Ackerman’s scientific knowledge about leaves comes from observation or research? Explain. Answer: I think Ackerman’s scientific knowledge about leaves comes from research because she uses sophisticated explanations and terminology. 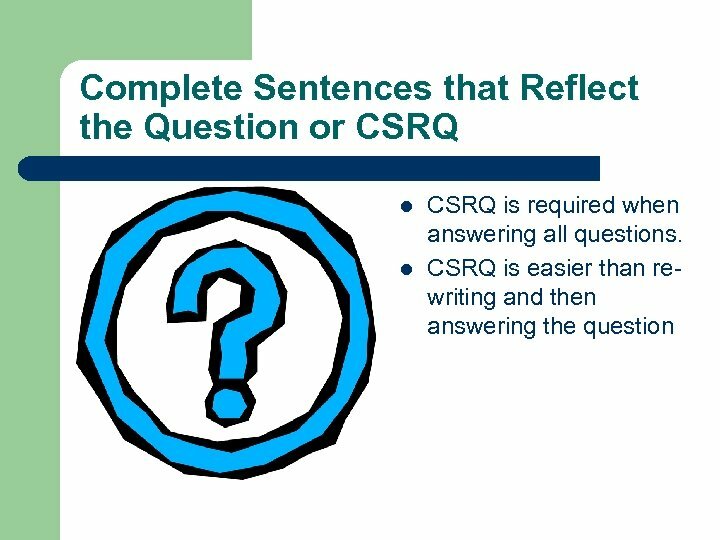 Inverted word order l l l It is acceptable to use inverted word order in CSRQ if it still makes sense! Question: What are three things people do with fall leaves? 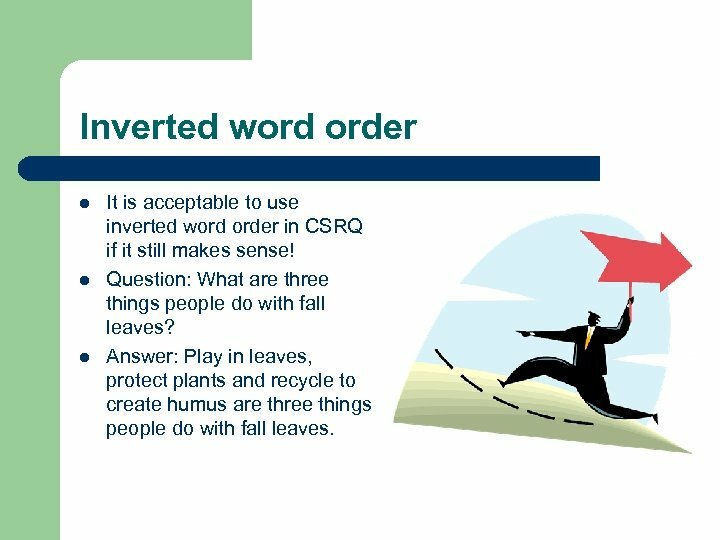 Answer: Play in leaves, protect plants and recycle to create humus are three things people do with fall leaves. 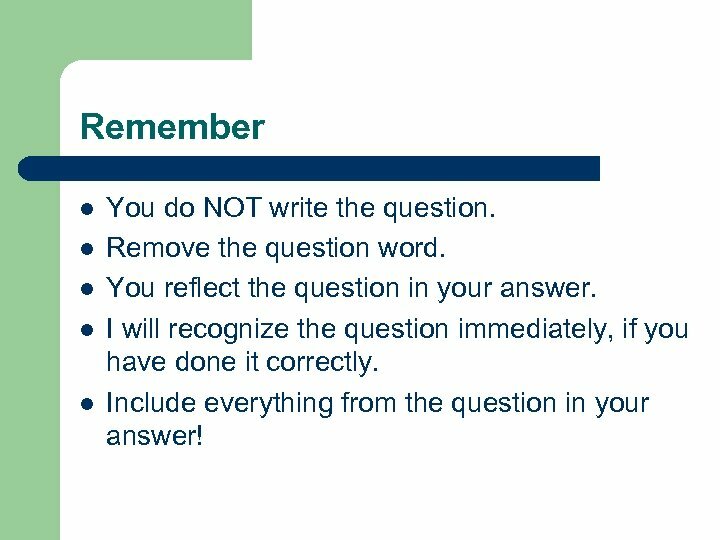 Remember l l l You do NOT write the question. Remove the question word. You reflect the question in your answer. I will recognize the question immediately, if you have done it correctly. Include everything from the question in your answer! More Examples… l l Question: Who wrote the book entitled White Fang? Answer: Jack London wrote the book entitled White Fang. 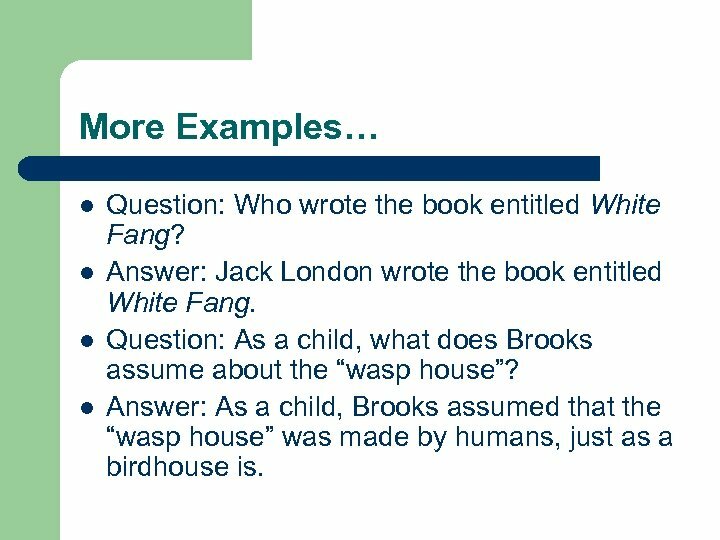 Question: As a child, what does Brooks assume about the “wasp house”? Answer: As a child, Brooks assumed that the “wasp house” was made by humans, just as a birdhouse is. Don’t Forget!!!!! l l l Always capitalize the first word in every sentence! Always end your sentences with some form of punctuation, such as a period! 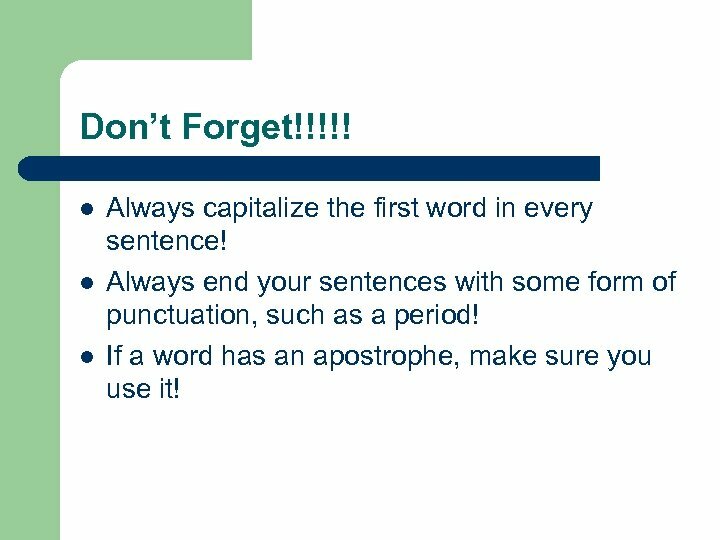 If a word has an apostrophe, make sure you use it!